TWO residents of Rundu in the Kavango East region find themselves in police cells in the Ohangwena region since last week, arrested while allegedly trying to contact a potential buyer of an elephant tusk they were carrying. The potential buyer is said to be an unidentified Chinese businessman. 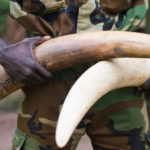 Police spokesperson Warrant Officer Kaume Itumba identified the two alleged elephant tusk sellers as 34-year-old Muronga Timoteus and 24-year-old Kwelana Kristian Sintango. They appeared in the Ohangwena magistrate’s court on Monday and the case was postponed to the 7th of June for further police investigation. Both were remanded in police custody.